Icons, Pseudonyms, and Avatars – Oh My! The traditional physical classroom has not changed much in the past hundred years. It contains desks and chairs for students, a teacher desk and chair, a board on which to write or project and wall space which is often decorated with appropriate curricular materials. The most important instructional resource in the classroom is the teacher. A skilled teacher manages the space, materials, furnishings, and students to ensure that students are engaged and learning. A virtual learning space has less boundaries and limitations and a skilled teacher is again the most important resource. The teacher must manage the three-dimensional virtual space, guide students to navigate and interact with the environment and provide experiences to ensure that learning takes place. 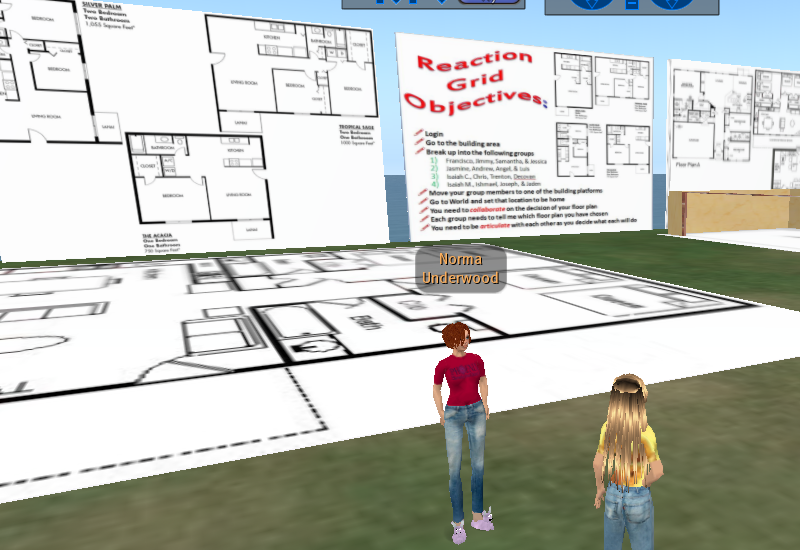 Norma Underwood uses both real-life and virtual world classroom management strategies to ensure learning for 5th - 8th grade art students on her sim in Reaction Grid. So I tried to check out a couple of educational sites that would give me information about educational use of virtual worlds and this is what I got. I made the mistake of doing this from my workplace, an educational facility. Virtual Pioneers, a site for collaborating educators, is classified as “dating, computing, social networking” and the URL is blocked by my school district. Jokadia, a site to document the educational uses of a range of virtual worlds and games was classified as “games, reference material” and is also blocked. This is what educators deal with daily in an attempt to be innovative and meaningful with the students they teach. The challenge of preparing students with 21st Century skills is daunting enough and made more difficult with the constant battle over what can be accessed. On June 4, the Online Safety & Technology Working Group sent its 150-page report to Congress. Anne Collier co-chaired the committee and discussed the recommendations at the most recent ISTE Speaker Series on another blocked site, Second Life – I watched it from my home at 8PM. Anne discussed “a more intelligent approach”. She suggested an approach in which children are given opportunities to practice with social media under adult supervision. The participants at the ISTE event were educators from around the world and it was obvious that the ones from the United States were having the biggest struggles with the issue of filtering and blocking. We all agreed that privacy and safety features were essential but that teaching students about good citizenship in an environment where behavior occurs is essential for their futures. According to Ms. Collier the educational systems in Australia and in the United Kingdom promote helping students to use appropriate filters rather than enforcing strict filtering polices as we do in the United States. Teaching children to filter prepares them to deal with Internet safety and appropriate behavior, implementing a strict filtering policy does not. There are some school districts who are more progressive and forward thinking, less fearful. A high school in New Jersey is taking advantage of social networking and using the technology to help students. A school in Oregon has documented improved student achievement after social networking was embraced. Teachers do get tired of “the fight” and just go back to an old-fashioned way of doing things. My suggestion is to keep doing what you know is right to help our students be prepared for a future we are uncertain of. In their book The New Social Learning Bingham and Connor devote a chapter to the topic of social learning in immersive environments, describing the successful uses in multiple corporate training programs. Social learning involves interaction, engagement and mutual exchange and benefit to participants. The research on the successful use of immersive environments in professional development and post-secondary education are certainly reason to consider exploring these strategies in the K-12 sector.